UK's millennials on track to be the most overweight generation since records began. Health experts have warned that the UK's millennials are on track to be the most overweight generation since records began. Based on population trends, more than 70% of people born between the mid-80s and mid-90s will be too fat by the time they reach middle age. This is compared to the Baby Boomer generation, born just after World War 2, of which just under 50% were considered overweight at the same age. According to Cancer Research UK, which led the study, obesity is linked with 13 different types of cancer, including breast, kidney and bowel cancer. The charity went on to explain that only 15% of people in the UK are aware of the link. Britain is the most obese nation in Western Europe, and rates are increasing at a faster rate than any other developed nation. In 2015, the average age of obese people was between 55 and 64, though experts now worry that younger generations are becoming fatter still. 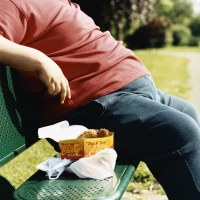 Cancer Research UK now wants to make the risks associated with obesity clear to the UK population. "Extra body fat doesn't just sit there," says spokeswoman Prof Linda Bauld. "It sends messages around the body that can cause damage to cells." "This damage can build up over time and increase the risk of cancer in the same way that damage from smoking causes cancer." Prof Russell Viner of the Royal College of Paediatrics and Child Health, said: "There is a danger that being overweight is becoming normalised, as we know that many people struggle to recognise obesity in themselves, and often are unable to see when their child is overweight. "Knowledge of the links between cancer and smoking have driven smoking rates down dramatically amongst our young people. "We need the same recognition of the dangers of obesity." There are ways to stop these dangers becoming a reality, says Prof Bauld. "Eating plenty of fruit, vegetables and other fibre-filled foods like whole grains, and cutting down on junk food is the best way to keep a healthy weight," she says. World First offer a wide range of insurance packages to suit every traveller. Make sure to organise your insurance before your next trip.